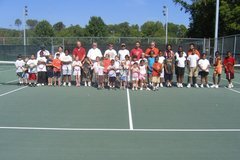 Did you know you can get free tennis lessons every Saturday atGeorge Ward Park in on the border of Southside and Homewood. The program is from 9 a.m. to 11 a.m. There's a one hour presentation by a health professional focused a variety of topics. Then from 10 a.m. to 11 a.m. you'll receive personal instruction on the tennis courts. Children ages 6 and up can participate as well. They receive lessons during the 9 a.m. to 10 a.m. session. Everyone will be entertained and educated during the two hour program. The program last through June 26. There is a sister program at the Jame Lewis Tennis Center in Ensley. Racquets are available or you can bring your own. Go here for more info about the program and grant providing the lessons. April 20 there will be an exhibition game and lesson with professional tennis players for tennis circuit. It's from 3:30 to 4:30 p.m.